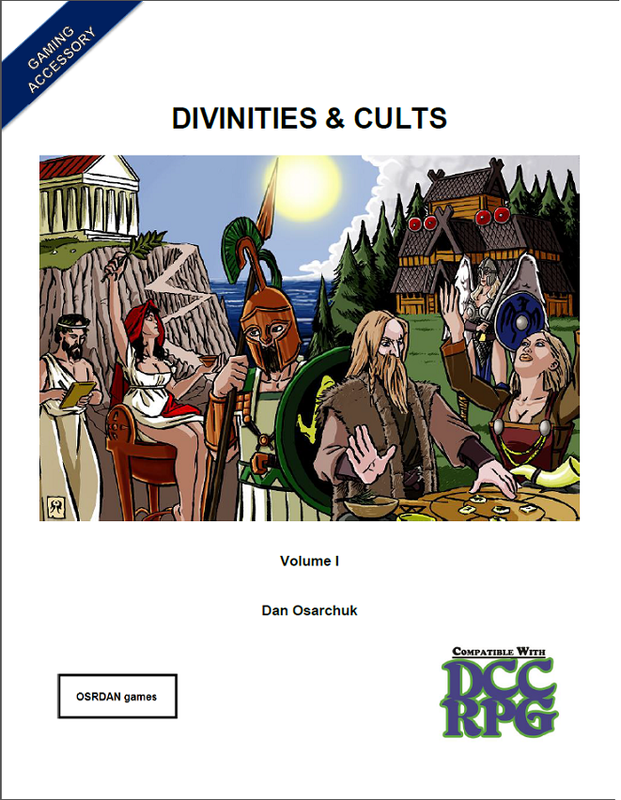 Divinities & Cults Volume I was written by Dan Osarchuk. It contains illustrated by Luigi Castellani, Bradley K. McDevitt, Traci Meek, and Fred Dailey. It was published by OSRDAN Games. This product focuses on the Greek and Norse Mythos, and the "Volume I" indicates that there may be more to come. In essence, this product is intended to allow the judge and players to make each deity different, and, by extension, differentiate between clerics of, say, Zeus and Odin. It does this by offering unique tables for Lay on Hands and Disapproval for the various divinities covered. Want to know what spells your god grants? This product will tell you. The tenets of each god is provided (which helps to determine sinful use of divine power), as well as useful things such as special requirements for clerics, allowed weapons and armor, holy symbols, unholy creatures, and anything unique to clerics of a specific deity For instance, "Up to once per day per CL, a cleric of Artemis can immediately cast one of her spells on a target that she hits with a bow shot." Several special encounter tables are included, for places like meadows, forests, and temples. New monsters are provided, including the Calydonian Boar, nymphs (or huldrar), vampires (or draugr), satyrs, sileni, and maenads. There are also new rules or suggestions for things such as magical boons, comeliness, wisdom, Vikings, simplified Turn Unholy checks, Luck, theism, amazons, and witch hunters. Neither that list of new rules, or that list of new monsters, is complete, by the way - Divinities & Cults contains more of both. Better, all text is Open Gaming Content, so you can make use of all of this good stuff in your own products. At the time of this writing, this product is only available in pdf format, and only the first volume is available. I would certainly buy future volumes, and hope one day for a print compilation of this work. If the author does decide to continue with future volumes of Divinities & Cults, I would love to see patron write-ups where appropriate. A second volume was produced for Labyrinth Lord and made available on 29 August 2016, so one can always hope. That volume contains information on the Roman and Celtic pantheons as well as five evil cults. Do you plan on setting up POD for Vol 1 & 2? Yes, POD is the next project.